I’ll try to make this short. 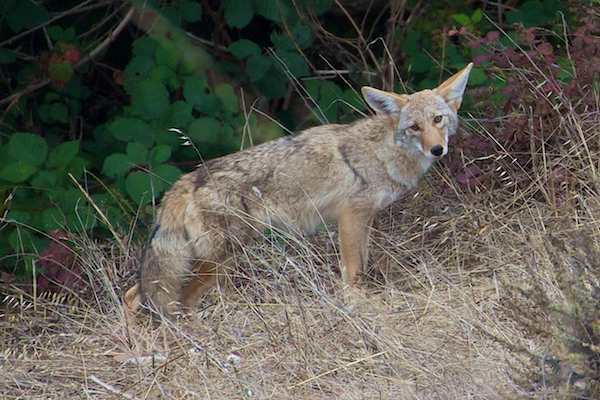 I walk in a certain area and know of two coyote pups (about 4 – 5 months old) that are on their own (I know mom was sick and died when pups were only a couple of months old). I’ve been taking some dog food and hot dogs for them, but want to know if they can survive on their own. Would they know how to hunt on their own? I do not get close to them, I just leave the food. Hi Cynthia — Thank you for watching out for the coyotes, and thanks for reaching-out to me. Probably the sooner you stop feeding them, the better for them. I’ve contacted a wildlife-rehabilitator, Linda Potter, who regularly took-in coyote pups to her rehabilitation center, raised them (always keeping her distance, never interacting and limiting being seen), and released them when they were ready. Coyote pups are born in the spring. Through the summer, the parents are feeding them and teaching them to get food. Some of them disperse in the fall to find their own territory, while others stay with the family to help raise the next litter the following spring. Because they live in family units, while the mom is important, the rest of the family (dad and the older siblings) also care for the pups. Because it doesn’t sound like the whole family was wiped out, they will be ok without any feeding. Generally the parents stop feeding the pups by the end of the summer. So, even if they were totally orphaned, they are probably old enough now to be on their own. At the center we followed this general timeframe (born in the spring, fed and learned to hunt in the summer, disperse in the fall), but also had the advantage of being able to test them to be sure that they knew how to hunt. It is amazing how quickly they learn when they are hungry. I’d say stop feeding them right away as you don’t want them to be dependent on this food source. You want them to be motivated to perfect their hunting skills before the winter sets in and there are fewer prey available.